Amaraksosodghatana, the title of commentary, is well justified, as the study reveals; it helps the reader in opening the treasure house of words, viz., the vocablury of Sanskrit Language. The commentary is handy and enlightens the reader wherever the text, AK, is too brief without explanations or ambigious. K's knowledge in a vast range of literature is revealed from his citations of literary works numbering more than hundred works from the Vedas, Itihasa, Purana, Smrtis, Kavyas, Ayurveda texts, Jyotisa texts and so on. From the study and analysis, K Still the earliest commentator with his text fully available stands as a beacon light illuminating the work of Amara. A glimpse of the Socio –Cultural status of India between 6th C. A.D. and 11th C. A.D. is brought to light by the study of the text Amarakosa and its commentary Udghatana. Astadhyat jaganmata Amarakoso jagatpita –according to this famous adage one desirous of mastering Sanskrit should learn both Astadhyayi and Amarakosa. There are number of kosas available; but Amarakosa has a special place among poets and scholars as is evident from the large number of commentaries it has attracted. "India as known to Panini " by V.S. Agrawala and "India in the Time of Patanjali" by B.N. 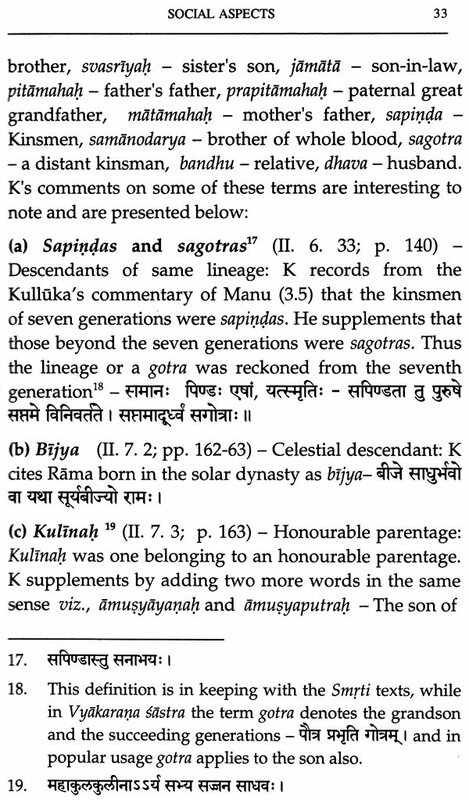 Puri have paved way to a new stream of Reasearch Scholar have attempted similar studies in the kosa literature too. Dr. Mahes Raj Pant a pioneer in this field has published a detailed study on the commentary of Jatarupa on Amarakosa, Jatarupa's commentary, through earliest, is available only in fragments. Inspired by the above works a similar study was taken up for my Doctroal thesis. 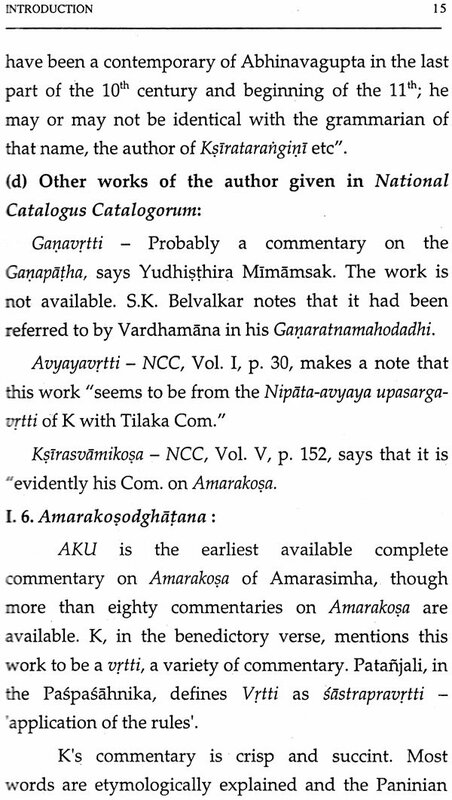 The study of Amarakosodghatana, a commentary on Amarakosa, by ksirasvamin (ed. By Dr. Hardutt Sharma and Dr. N.G. Sardesai, Oriental Book Agency, Poona, 1941,) has thrown much light not only on liguistic aspects but also on the socio –political and cultural aspects of the then India. The present book is the modified form of my Ph.D. thesis submitted to the University of Madras, through the Kuppuswami Satri Research Institute. It was approved and degree was awarded in 2014. I acknowledgement with gratitude the valuable guidence extended to by my Research Supervisor Dr. V. Kameswari in the preparation of this thesis. I would also like to thank Dr. M. Vijayalakshmi of Banglore, for reading the text with me. I wish to record my thanks to Dr. K.S. Balasubramanium and Dr. T.V. Vasudeva, Deputy Directors of the K.S.R. institute for reading the text with me and also for their help and advice in the development of the thesis. I am thankful to all the staff of the K.S.R.I. Library and the authorities of the Adyar Library and Research Centre for allowing me to user their Library. I thank the Syndicate of the University of Madras for having permitted me to publish the thesis. I am thankful to Ms. K. Vidyuta, Ph. D research scholar, K.S.R.I and Mr. B. Ganapathy Subramanainan, Staff of the Madras Sanskrit College, Chennai, for the neat typesetting and format. I express my sincere thanks to the authorities of the Karnataka Historical Research Society for publishing my thesis as a part of the Centenary Celebrations of their Society. Lexicography or Kosa writings naturally precede the regular analysis of language as it largely sometimes gives the metaphorical sense santioned by the the usage, but the primarily significative power is not to be assumed in such cases. The domain of Kosa literature is also of varied types. 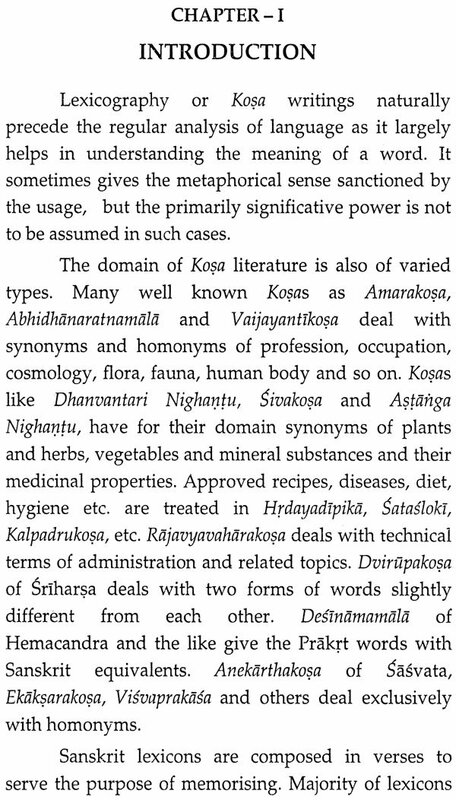 Many well known Kosas as Amarakosa, Abhidhanaratnamania and Vaijayantikosa deal with synonyms and homonyms of profession, occupation, cosmology, flora, fauna, human body and so on. Kosa like Dhanvantri Nighantu, Sivakosa and Astanga Nighanta, have for their domain synonyms of plants and herbs, vegetables and mineral substances and their medicinal properties. Approved resipes, disease, diet, hygiene etc. Rajavyaavaharakosa deals with techinical terms of administration and related topics. 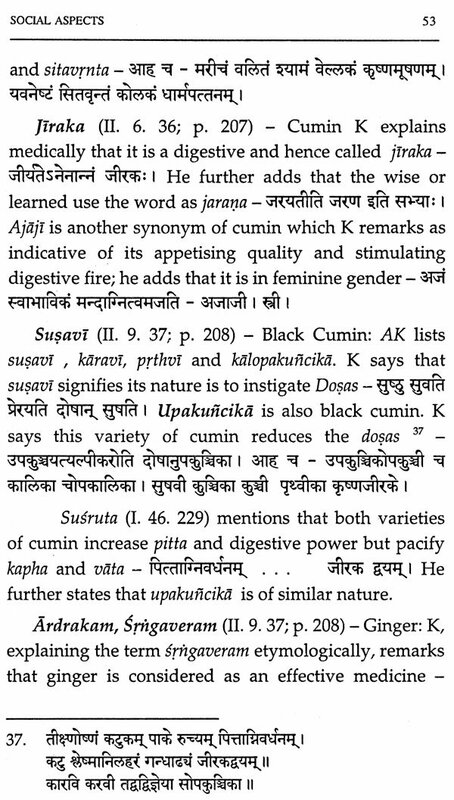 Dvirupakosa of Sriharsa deals with two forms of words with Sanskrit equivalents. Anekarthakosa of Sasvata, Ekasarakosa, Visvaprakasa and others deal exclusively with homonyms. Sanskrit lexicons are composed in verses to serve the purpose of memorising. Majority of lexicons deal with either synonyms or homonnyms while some deal with both. The words are arranged subject –wise, with further sub –divisions based on grouping of words of one, two, three and more syllabus or by the first or the final syllable. The commentaries help in understanding the meaning of words either by giving their synonyms or by describing their meanings. 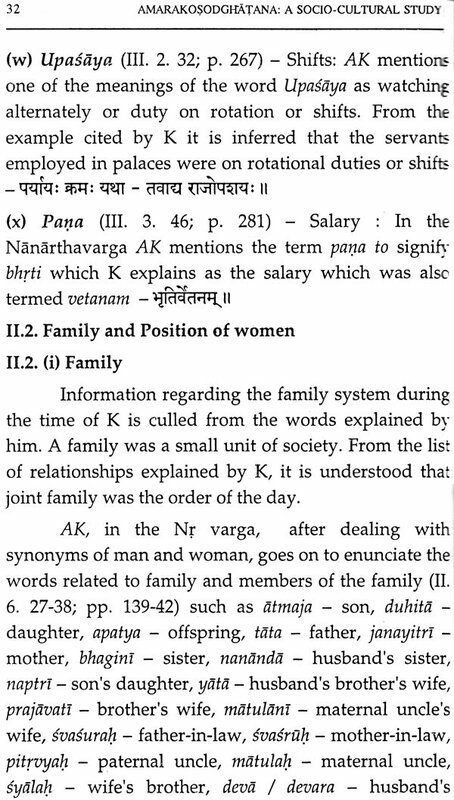 Patanjali in his Paspasahnika highlights the role played by the commentator in deciding the meanings of a word solely based on the commentary. The lexicographical literature and commentaries on them form a large portion of Sanskrit literature They have acquired a position of great significance in the history of Sanskrit literature. Still, not much study has been done on this section of literature. 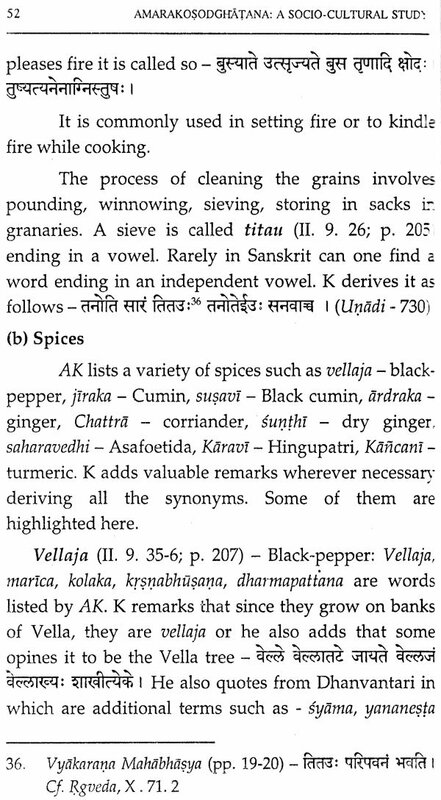 Though there are many articles by great scholars on the nature of lexicons, their specialities, their uniques contribution to the development of Sanskrit and so on, only a few studies are available on lexicons as a separate genre of literature, like –indian lexicography by Vogel Claus (pub. 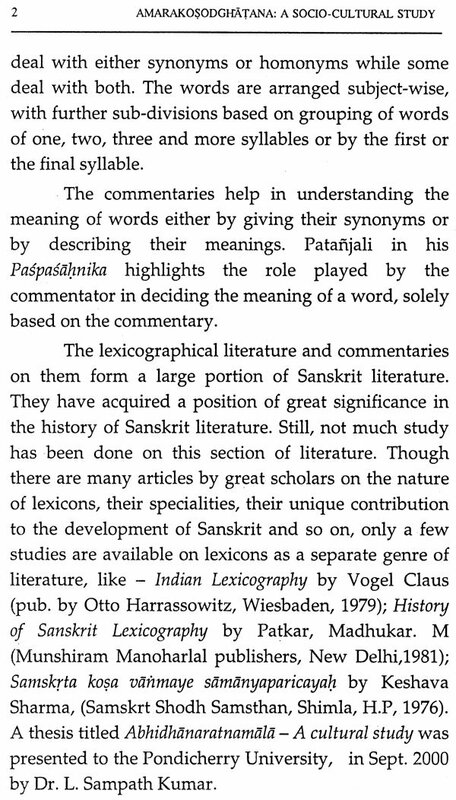 By Otto Harrasssowitz, Wiesbaden, 1979); History of Sanskrit Lexicography by Patkar, Madhukar. 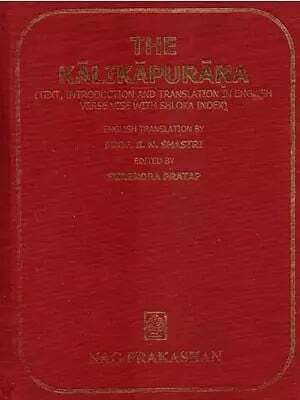 M (Munshiram Manoharlal Publishers, New Delhi, 1981); Samskrta Kosa vanmaye samanyaparichayah –A cultuarl study was presented to the Pondicherry University, in Sept.2000 by Dr. L Sampath Kumar. Amarakosa of Amarsimha is the earliest lexicon available belonging to the 6th centuary A.D. followed by the other lexicons mentioned above. Amarakosa is called Namalinganusasanain by the author himself beacause, along with the synonyms, the genders are also denoted by certain techniques mentioned at the beginning of the work. The Amarakosa itself was a compilation of earlier lexicons as stated by the author. He further declares that the words arranged wrongly in the earlier lexicons were rearranged by him according to certain principles; also the mulititudinous classes unnecessarily. Sectioned in the earlier lexicons were shortenned by him. The popularity of Amarakosa is evient from the fact that it has more than eighty commentaries, of which only about fifteen are published and the rest are found in manuscripts. But there has not been much study done on Amarakosa or its commentaries despite the fact that the editions of Amarakosa by Borooah (with com. Of Xirasvamin and Mukuta, Berhampore, London, 1887), K.G. Oka (with Amarakosodghatana, Oriental Book Agency, Poona 1941) and A.A. Ramanathan (with unpublished south Indian Commentaires Amara –padavivtri of Lingayyasurin and Amaraparijatta of Mallinatha, The Adyar library and Research Centre, Madras, 1971) carry introductions of great academic value. The Amarakosasya vatayanat, by Dr. Rama Duabalish (Vidhyanidhi Prakashan, Delhi, 2003) and Namalinganusasame paniniyaprabhavah by Prof Janmaddi Ramkrishna (Rashtriya Sanskrit Vidya Peeth, Tirupati, 2005) are major studies done on Amarakosa. While studies on Amarakosa itself are quite few only much less can be stated about its commentaries Except the study on the commentary of Jatarupa by Dr. Mahesh Raj Pant (MLBD, Delhi, 2000), no other study on commentaies on Amarakosa has been done on detail. It is to be noted that the Jatarupa's commentary is available only in fragements. Hence Ksirasvamin's commentary viz. Amarakosodghatma is taken up here for study. 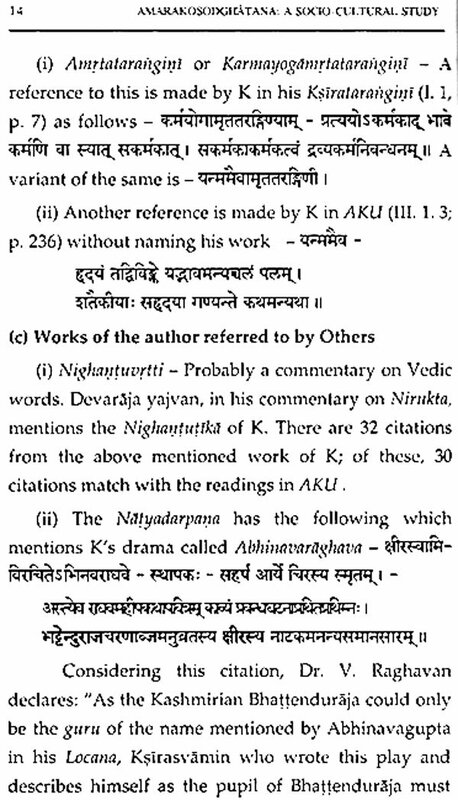 Ksiravamin (hereafter K) and his commentary, Amarakosodghatana, (hereafter AKU) on AK, have both been often referred to and cited by many commentators of AK and by other writers of different geners of literature. However, little information is available about his date, native place and his life. Scholars all over the world have made efforts to fix his date and native place from his own writings and form external sources. This has resulted in varied opinions differing vastly from one another. Dr. V. Yamuna Devi has won Gold Medal and a II Rank Holder in M.A. Sanskrit (Sanhitya) from Banglore University. She holds M. Phil and Ph. D Degrees from the Universtiy of Madras being a research Scholar at The Kuppuswami Sastri Research Institute. Vyakarana is her field of interest. She has five years of teaching experiene at the Stella Maris College, Chennai. Since 2014 She is Associate Professor at The Kuppuswami Sastri Research Institute. She has presented paper in National and Internaitonal Conferences and has contributed research articles to International Journals. She has assisted in publications of the Sanskrit Academy, Chennai.